In this session, you will learn how digital can significantly enhance your facilitation practice. Whether you are a Creative Problem Solver, a Design Thinker or a 6 Sigma Black Belt, you will see that the right mix of digital tools and methods can help you design and facilitate highly engaging collaborative sessions. You will manage group biases more easily, engage larger groups and be able to facilitate sophisticated sessions with remote teams. This session will be about tools AND also about the core principles that you need to apply to create engaging sessions that foster human to human interactions. The session will be highly interactive, it will be intense and it will be fun! Alexandre Eisenchteter co-founded Stormz (https://stormz.me) in 2012. The startup has created a software that leverage collective intelligence during meetings, innovation sprints, training sessions, and events. 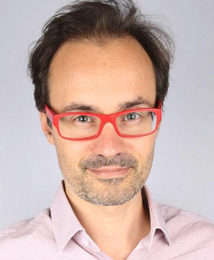 As Stormz lead facilitator and an experienced Creative Problem Solving practitioner, Alexandre has designed and facilitated hundreds of meetings, ranging from 10 to 1200 participants, for some of the most prestigious companies in France and beyond. Prior to creating Stormz, he spent nearly 10 years at 3M, where he facilitated numerous CPS sessions and 6 sigma workshops. He then served as COO of af83, a web technology company.